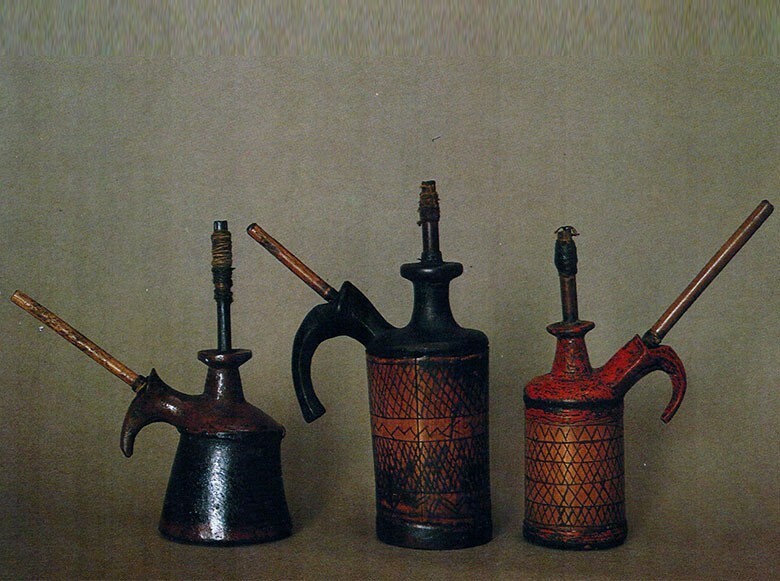 Smoking Hukkas or pipes. Etched and pigment-painted bamboo; 17 cm; 15 cm; 13 cm. Probably Mizoram. c. early 20th century. 86/6964; 86/6965; 86/6966. Hollow bamboo culms with a base formed at an internode, or hollow cane, are used as water containers in the ingenious construction of hukkas or pipes used by both men and women of the North-East. A portion of a rhizome, the underground stem of bamboo, forms the upper lid which is made so as to hold two pipes, one along the central vertical axis, and the other, diagonally, and generally longer than the first. This second pipe is used to pull in the smoke while the vertical one is used to hold a clay receptacle, now missing, containing tobacco. Sheetalpati, floor matting. Split cane; 72 cm x 60 cm. Goalpara, Assam. VC. A special type of cane (Clinogyne dichotoma) locally known as patti bent1 or mutra in Bengali, patti due in Assamese and amjori in Garo, is used to create the most beautiful floor mats in India. Generally undyed, the natural subdued tones of the dried split cane create a phenomenal effect on the hand woven surface of the sheetalpati, literally, “cool matting”, ideal during the sultry heat of the Indian summer. Sheetalpati is an important item of exchange between the families of the bride and groom and in fact seals the ties between the two. Designs centering around the diamond, or rhomboid shape, also known as jamdani, are created by using naturally darker or dyed slips. The triangular pattern is known as teen kani, the square or rectangular as then chek, or just chek, the grid pattern is called bielan, rows of horizontal lines, dusa, and a square divided into four smaller squares with different weaves is known as the choot jabra jamdani. It is interesting how the jamdani, a famous brocaded fabric of the region, is employed in the design terminology of the patikars or mat-weavers of Assam. 1.In conversation with craftsman Akhil Chandra Pal from Goalpara. Grain Baskets. Split cane and bamboo; 62 cm x 30 cm; 20 cm x 18 cm. Arunachal Pradesh. c. mid 20th century. 86/6988; VC/235. 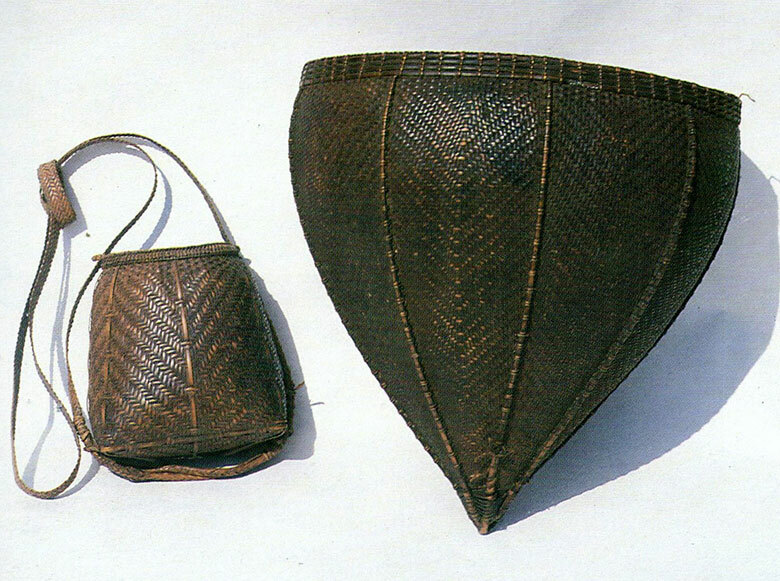 The Nishi tribe have a distinctive carrying basket hung across the back with a head strap made of braided split cane. The baskets are primarily used to transport grain from the fields and therefore have a tight or “closed” weave structure. 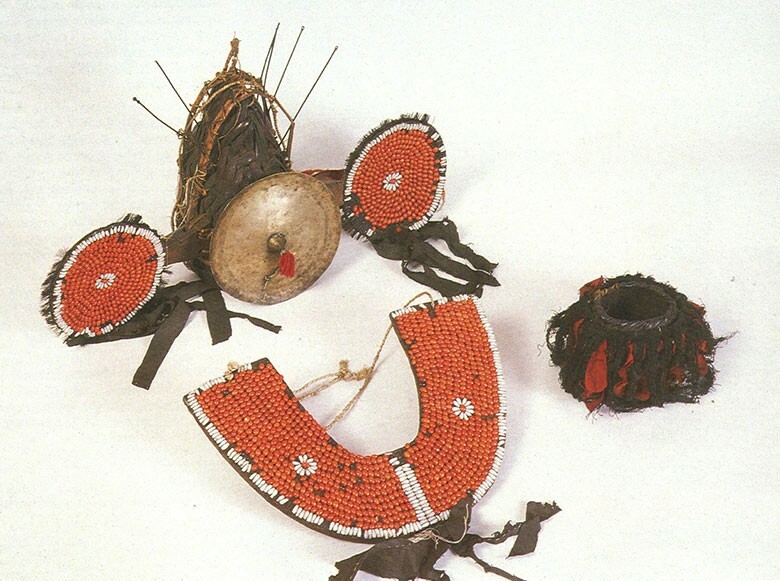 The conical shape with a slight bulge below the rim is characteristic of the baskets of the tribe.1 The seed basket of the Adi Gallongs of Arunachal, also known as the kyayong2 is somewhat different. Its long straps are easily strung across the shoulders. The rectangular base and oval rim give the basket the shape of a container rather than a carrying basket. It is also used as a grain measure in addition to transporting grain from the fields. Cheetah. 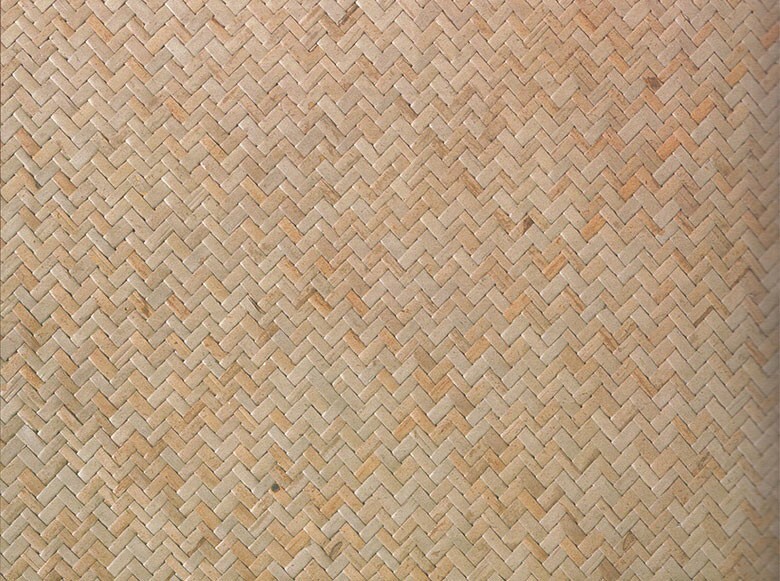 Pigment-painted split bamboo or cane; 137 cm x 48 cm. Probably North-Eastern India. c. mid-20th century. 7/5780. 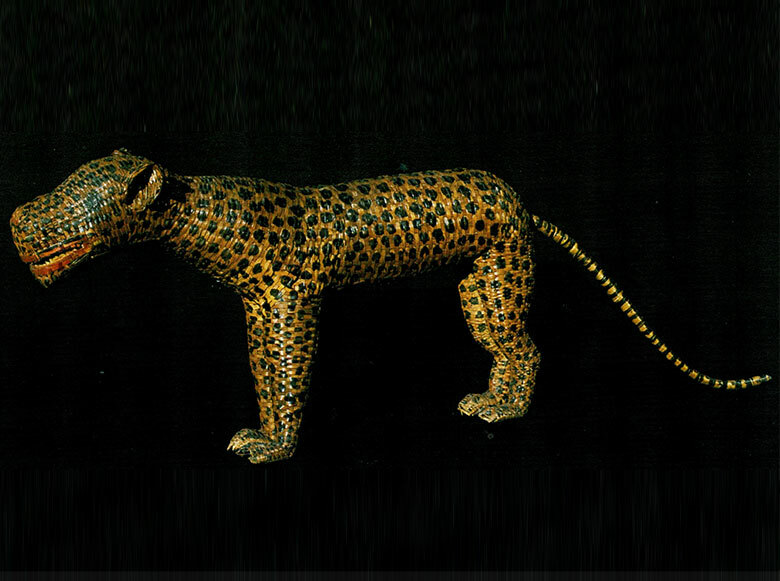 An unusual construction in split bamboo or cane is this extremely nimble-looking cheetah, or hunting leopard, now said to be extinct in India. The long animated tail and slender body of this agile and light-footed animal truly capture the essence of the cheetah, the swiftest sprinter of the jungle. Ceremonial headgear. Brass, goat hair, red seeds, basketry and cotton rags; 59 cm x 39 cm. Nagaland or Arunchal Pradesh. C. 19th century. 86/7110. Red seeds of the Abrusprecatoriustree adorn this unusual head-dress, probably worn by the chief or prominent warrior of the tribe. The U-shaped band is meant to fit exactly below the chin1where it rests covering the neck in a proud display of martial glory. The matted cane or bamboo ring-like contraptions, one of which is missing, are wrist-bands of a rather “sporty” warrior. A brass disc adorns the conical cane and bamboo hat that fits neatly over the head. Feathers of the hornbill – usually arranged in a semi-circle above the head – now missing, are final touches added to the spectacular headgear.